Custom Party Wear Products, UK | Order Yours Online Today! 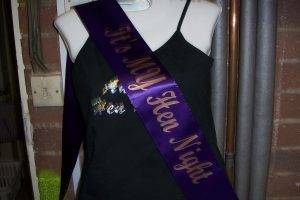 Our custom party wear products for parties include customised badges, rosettes, custom printed sashes as well as lanyards and wristbands. 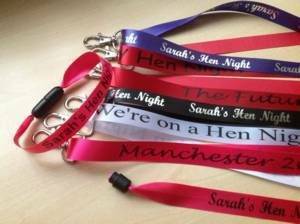 On the links below you will find more details about the specific custom party wear products for birthdays, hen nights , stag nights, product promotions, schools and a whole range of applications where our badges, sashes, rosettes, ribbon products, lanyards and wristbands can be used. We pride ourselves on our excellent quality products, which are attractively prices and which can be ordered for next day delivery. 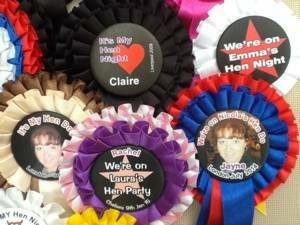 We make the badges, make the rosettes and print the sashes ourselves so we are able to offer quick deliveries and a personalised service to satisfy your needs. All you need to do is select the custom party wear product of interest. The links below will take you to the relevant place on our web site. You will then be able to find additional information. The links above will show you a wide range of designs for our badges and rosettes. 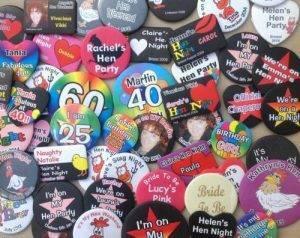 These include badges that are based on just text, photo badges and badges that have various images on them such as hearts, lips, stars, hens, chicks, stags, birthday cakes and a whole range of images specifically for children’s birthdays. If you decide that you would like a photo badge, then you can easily upload the photograph when you order. Alternatively if you would like to send us the photo before orering then just attach it to an email. We will then let you know if it is suitable. We can take the photo in most graphic formats, but please do not embed the photo in a word or pdf document as this can reduce its size and resolution. If you only have the photo in hard copy then you can post it to us. We can then scan it and return it with your order. The products below are just a small selection of our most recent products. Use the menu at the top of the page or over the images above to find your badges, sashes, rosettes, ribbons, lanyards and wristbands.